Subject: [Roger's Reviews] Fighting Formations: ... and it even comes with tanks! 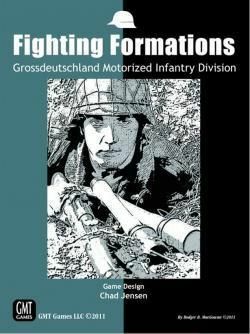 Fighting Formations: Grossdeutschland Infantry Division is the first game in a new series from GMT Games. Much like the Musket & Pike Battle Series, each game in the series will share core rules and the playbook will have specific game exclusive rules. This inaugural game covers action on the eastern front in WWII between the Germans and the Soviets between 1942 and 1943. This is a two player game designed by Chad Jensen of Combat Commander: Europe fame (among other titles). Scenarios run the gamut from approximately 2-3 hours for smaller scenarios to a large double map scenario that could fill an entire weekend. GMT has recently set some impressive standards in wargame publishing. 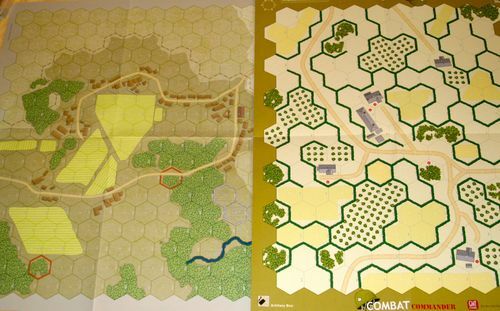 Mounted map boards for single map games like Washington's War and high quality paper maps for multi-scenario games and expansions such as the recent Combat Commander expansion. Beautiful counters that are both functional and nice to look at. In this respect GMT has delivered the goods again. The box however is of the old school thin cardboard style that GMT has not used in a long time. A small quibble is that they used a standard 2" box rather than the thicker 3" box; this is a mild disappointment as there is a lot packed inside. Everything does fit into the 2" box even using two counter trays, but you'll need to split the card decks to make it even along the top. If and when expansions come to this module of the series, it might not fit. The smaller box shouldn't be seen as a deterrent however. There will be more games in the series and those linear feet of shelf space fill up awfully quickly with the larger boxes. I should know, my closets overflow with games. The maps are very attractive and functional, although I found the colour contrast to be muted when compared here with the Combat Commander maps; as you can in the photo here, the Combat Commander terrain features are more easily seen than with the Fighting Formations maps. What's also abundantly clear here is that the Fighting Formations' maps are larger than your typical Combat Commander scenario. The introductory scenario in Fighting Formations uses a half sheet map like Combat Commander, but the other scenarios are all on full and in some cases even double map sheets. The maps are historical depictions of parts of the eastern front. The scenarios all come with a nice long historical background to give the sense of the events about to unfold on the board. And... for those who felt they were missing from Combat Commander, yes folks, Fighting Formation comes with tanks! Yes, it comes with tanks! The rules span two volumes: the core rules and the playbook. The rules are not short, covering some 24 pages and the 64 page playbook adds about another dozen pages of game specific rules and some optional rules. The rest of the playbook is devoted to the 10 scenarios, designer and historical notes, orders of battle, and a detailed example of play. The index is included at the back of the playbook, which can be a nuisance when you're looking for something that is actually in the rulebook, especially anything to do with the sequence of play, but a quick photocopy of the index page is a quick and easy remedy. 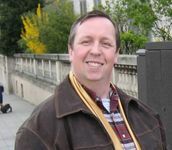 What's important is clarity and ease of finding information, which are a hallmark of Chad Jensen's games. Even newcomers to wargaming would have little trouble learning the game from the rules, and veteran Combat Commander players will find a lot of familiar terminology. The player with the most victory points when the scenario ends is the winner. Fighting Formations is a classic hex and counter game in many ways. We have the standard hexes, tanks and artillery pieces with facing and fire arcs, movement modified by terrain, and counters chock full of information. There are even rules for vehicles moving in reverse. An interesting and deliberate omission are any stacking rules (except for vehicles moving in column). One could theoretically place every single unit in the same hex. It would be extremely foolish to do so, but you can if you really want to. The lifeblood of Fighting Formations is the order matrix shown above. In order to do anything, you must select a cube from the order matrix, and the value of the cube limits which orders you can execute. For instance, if you select a "5" cube as the Germans, you can do anything value 5 or less (in descending order - assault, rally, move, fire, [use an] asset). Tightly integrated to this cube selection process is a push-pull initiative track where as long as the initiative marker is on your side, you get to select and execute orders. This nicely does away with both the "IGO-UGO" model of the classic hex and counter wargame, and also gives players somewhat more control than a random unit activation chit pull system. What Fighting Formations does succinctly with this system is differentiate the capabilities of the Germans and the Russians as the values differ for each side. An assault order is a 5 for the Germans, but a 7 for the Soviets. The order matrix is populated with 10 initiative cubes and a turn is finished after the final cube is selected and used. Different scenarios have them begin in different spots. Once a turn is complete, the order matrix is reloaded with the 10 cubes placed by random die roll. This means each scenario play through will be different as the options available to each time will vary. Each full turn causes the time marker to advance which will allow reinforcements to come onto the board, and may also necessitate a sudden death roll. Sudden death is very similar to how it's done in Combat Commander; the right roll and the game ends immediately and the person with the most victory points wins. Neatly woven into this push-pull initiative track is command and control. 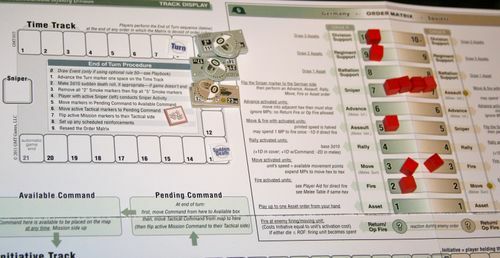 Command is abstracted with mission and tactical command counters. The command counters, when available, can be placed at any time and can command units within a scenario determined radius. The importance of command is in mitigating initiative cost. See, in addition to the initiative cost of selecting a cube, activating units can cost initiative unless they're under mission control. With Mission Command, any unit in range can be activated for free. Tactical Command allows unit activation for a cost of only 1 initiative, but units without command cost 2 initiative to activate. Note this cost occurs whether you're executing an order or taking advantage of opportunity or return fire. Mission Command can be especially important for the Soviets as many of their armor units, denoted with a circled R, do not have radios and hence cost double initiative points to activate (to wit, free under Mission Command, 2 under Tactical, and 4 otherwise!). As previously mentioned, you select a cube and then choose an eligible order. That done, you can activate as many units as you like for that order, provided you're willing to pay the initiative cost to do so. Active units are flipped to their "active" side which has different information on it than its inactive side. Active units are often more effective at combat with higher combat values. I found this flipping units over business a tad cumbersome, even with a small unit density scenario; clumsy fingers can make a mess pretty easily if units are close together. However, there's simply no way to cram any more information onto the counters and still make them usable, so flipping is simply the reality of this system. In practice, it's also easy to remember which units are in fact active and for rally orders its even unnecessary to do so. Naturally, all those orders and maneuvers are in aid of getting your units into combat with the enemy. Combat is an amalgam of range, hindrance and firepower type. Range determines which dice (2d6, 2d8, 2d12, or possibly even 2d20!) you use with the base always being d10. The roll of two dice is added to the firepower of the unit and compared to the defense value of the units in the target hex. Remember that comment about being able to stack everything in one hex? All units in the hex would need to roll against the hit value. Hindrance has an interesting side effect in that if the current hindrance or less is rolled on either die, it's an automatic miss. There's an inherent hindrance of 1 everywhere on the map, so if you roll a 1 and a 6 on two dice, you missed. Hand in glove with this is opportunity fire and return fire. Every unit has a "rate of fire" value, and if the defender rolls under that value with either die, that unit is considered spent and cannot continue op or return fire until it's activated again. An interesting effect of incorporating tanks is that infantry units cannot generally affect armored units, save in melee where presumably one is close enough to throw grenades into the tracks, and tanks need to choose whether they are firing armor piercing rounds (affecting other vehicles) or explosive rounds (effective against infantry). Defensively, units roll 2d10 and add it to their defense score. If the roll is greater than or equal to the incoming fire, they're ok. Otherwise, a damage chit is taken at random from a draw cup and placed on the unit. The damage chit will determine the rally target number needed to remove the marker from the unit. Vehicle damage markers are generally far more serious than for infantry units. It's harder to hit a tank, but once you do... kaboom! There's little as satisfying as placing an unconfirmed kill marker on a tank you just took a shot at. Thanks to the scale of the game, units can be split into three squads at the time of impact. One can easily imagine an infantry squad taking some hits from fire, leaving the wounded chaps with the medics (one company retains the hit marker) and the rest splitting into two squads to continue taking the battle to the enemy. Lest anyone think that these mechanisms are a little too distracting, let me reassure you that once the action gets underway, everything save the fact I am trying desperately to advance my units along the road to capture objectives and the electric tension at the table as the melees unfold in hexes completely eclipses the mechanics of the game. In fact, the simple elegance of the system really makes it transparent to the playing experience as I focus on what was happening on the board without pausing to step out of my suspension of disbelief to figure out a CRT column shift. Assets are just what they sound like. You can use assets to call in for air support, an artillery barrage, refresh on board command markers, and a whole host of other effects. You can also expend asset cards to execute special actions available to certain units. For a simple example, you can expend any asset card for APCR ammunition use with a tank capable of firing it. Assets are represented by cards in the game, but unlike other games which use cards, here they are simply the means by which the asset information is conveyed to the players. They could have just as easily been chits, but you can have more information on the cards to save rules referencing. There are a number of subsystems which need to be mentioned here, but I'll just do so in passing. There are special rules for air and artillery barrages which include targeting rolls for accuracy and drift. There are also melee rules for units in the same hex, where one must use a cross-reference chart to match the attacking unit to the target unit to yield the target number required to hit. Melee is also the only time infantry can really attempt to harm an armored unit (certain asset cards aside). Finally, there are also random events. Random events are completely optional; there for those who want a little spice with their game. The first thing I must say is this game is not Combat Commander. It's also not "just Combat Commander with tanks". 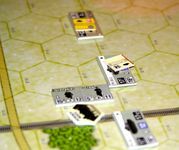 It's a classic hex and counter wargame in most respects using the very innovative order matrix as the engine. One would probably not be wrong in saying the order matrix borrows from Euro games in its inception and execution, but the outcome is pure wargame. I really liked the order matrix, and in particular that it can give you some control over the ebb and flow on the board while at the same time pressuring you to make the most out of each initiative point you spend. I also appreciate that the more complex/involved orders have to be selected from on high, whereas simple things like playing an asset card, moving, and firing tend to be in the 1-3 range. Of course, where the cubes end up on the matrix each turn is random, but that's something both players need to manage. The other thing I liked was the use of different dice types to resolve attacks. You typically roll 2d10 for shooting at another unit, but if you're in an adjacent hex, you roll 2d12. If you're too far away, you roll 2d8 or possibly 2d6. I found it a very nice way of simplifying the calculations needed to take a shot. There isn't much to dislike here, and these comments should be taken as minor quibbles rather than deal breakers. First, there's the flipping of units. As I mentioned in the flow of play section, it can be cumbersome to do so, especially if you have several units in a hex and at least one of them has some kind of hit marker on it. Second, the counters have a lot of information on them and it's easy to overlook some of it. The one that gets me most often is the easy to miss yellow circled R on the Soviets tanks (which is the indicator they have no radios, which affects initiative cost), even if only some of that can be attributed to old eyes. I highly recommend Fighting Formations. It's a solid design that should appeal to most WWII tactical scale wargamers. The game creates a strong narrative flow and the push and pull of the initiative track will ensure a game with a lot of action on both sides. You'll never be bored waiting for your turn because you'll be involved the entire game. The game comes with ten historical scenarios and one learning scenario, and these can be chosen to fit almost any time constraints one may have. The downside is that if you're routinely only going to have 2-3 hours for a complete game, then this game might not be for you as only some of the scenarios can fit that time window. However, if you can leave things set up or have longer times available, then this game is a real gem. It's also worth mentioning that more games in the series are already in the works. The next one will be about the US 2nd Armored Division (and the third most likely about the 1st Canadian Infantry Division). I also would not be surprised (indeed, I almost expect) to see some new scenarios or expansions inside the pages of a future C3i. Thank you for reading this latest installment of Roger's Reviews. I've been an avid board gamer all my life and a wargamer for over thirty years. I have a strong preference for games that are light on rules but heavy on purposeful decisions. Among my favorites I include Twilight Struggle, the Combat Commander Series, the Musket & Pike Battle Series, Julius Caesar, Maria, EastFront, Here I Stand, Napoleon's Triumph and Unhappy King Charles! Awesome review, Roger, as always! I concur with your assessment of the game in most every respect. I did have one additional "didn't like" - more of a subjective complaint rather than an issue with the game itself - and that is the constant adding/subtracting/rolling for results. I think it only bothered me because there is so much of it in this game. None of it is complicated, but it can become tedious. Wanted to point out one other thing, which confused me my first few plays . . . The double cost for Radioless vehicles only costs double if they are activated for a Move or Assault order. All other orders with Radioless vehicles are regular cost (0, 1, and 2). I am already looking forward to see you again at BGG Con! Melee is not simultaneous. The active unit makes its melee fire attack [34.2]. Then the non-active player has the option to return fire after the melee fire is resolved [34.3]. Excellent job Roger!!! Your review is right on! Yeah, there is a lot of "Ok, my tank fires with a 24 and adds 2d10 because I'm in range, and I didn't roll a 1 so it's a hit for 32 against your flank armor of 16..."
But it's not any worse than Combat Commander, and I do like it better than figuring out a CRT. You are of course correct. I tend to gloss over the details about rules in my reviews, partially in an avoidance at a mere rules regurgitation, and partially in an attempt to focus on the feel of the game. It's in no small part because the radioless effects only apply for more or assault that my opponents and I tend to miss it. I always subtract the defense factor plus cover before making the attack roll. I find it simplifies things a great deal. Having just ordered this, the review is mainly useful to me for confirming my decisions to purchase. Great review, however! I'm surprised I have somehow missed your reviews before. What I really love, as an idea for a reviewer, is your signature - listing examples of games you really love is a brilliant idea for folks to quickly get a fix on if your tastes and their tastes match. I wish other reviewers in general did this! Thanks! This is the first time I've done it, but I'm planning on including it with all my reviews from now on. Agree with just about everything in the review, and enjoyed the list of games as well. Now I must go to get supply's (read-buying a new shelf from IKEA) to prepare for the coming invasion (read-FF:GDMID order deliverd to my door)! Nice review, although tactical games aren't my preferred choice your review has made me seriously consider this. Also. I've read a few of your other reviews and really enjoy them - thanks & keep up the good work! Thank you for the wonderful review. You seem to recommend this game highly. But rate it a 5/10? I confess I got a little overenthusiastic in my re-ratings exercise early this year. I went through all my ratings and basically dropped anything I hadn't played (or had a chance to play) for a while down by as much as three or four points. FF deserves better. I've put it back up to a 7, which is more realistic. Great review thanks. I played my first game of FF last weekend and really enjoyed the experience. The only significant down side we found was the frequent need to work out what dice to roll, put them in the cup and roll. Especially when there are multiple attackers and defenders, having to choose and roll dice becomes rather laborious. Flipping cards for die rolls is far more efficient, so I wonder if FF would benefit from decks of cards being used to generate different types of rolls, as required.